While most of us in San Diego are able to start getting our lives back to "normal" It's apparent that we are being mindful of those whose lives my never get back to normal, but we must go on. Cathy who writes regularly on Kirk's blog said this. "Kirk send me the most touching note this afternoon, reminding me that our little inconveniences are nothing in the overall scheme of things. He said he was sweeping up ash...the right way, and putting it in the trash, when he realized he had better treat it with some reverence. "Who knows, it may have been someones most treasured possessions." Something we should all keep in mind when cleaning up after this tragedy." Can't add much to that. Thank you courageous firefighters, both on the ground and in the air. To the law enforcement that patrolled our neighborhoods keeping what, and who was left safe. Thank you to all the people who came out and volunteered and took care of those in need, both in shelters and to those who took strangers into their homes. I could go on, and on, citing example after example of how the people of San Diego came together in time crisis and need. You all make me proud to be a native San Diegan. As most everyone knows San Diego is burning, again. I've been glued to kusi news while our electricity is on. The high Santa Ana winds have prevented any air attacks on the numerous fires that have been burning out of control. Today helicopters and tankers are able to get in the air, great news for us. Kirk has maps and detailed information. I don't need to repeat what is only a click away. Kirk was kind enough to e-mail me this morning making sure I was o.k. and to offer assistance if needed. Thank you Kirk, you have no idea what that meant to me. I am feeling grateful and guilty, so many have lost so much. I'm sick at heart for my fellow San Diegans that are effected by these fires. I have been within minutes of evacuation myself, several times, thank God I've been spared. 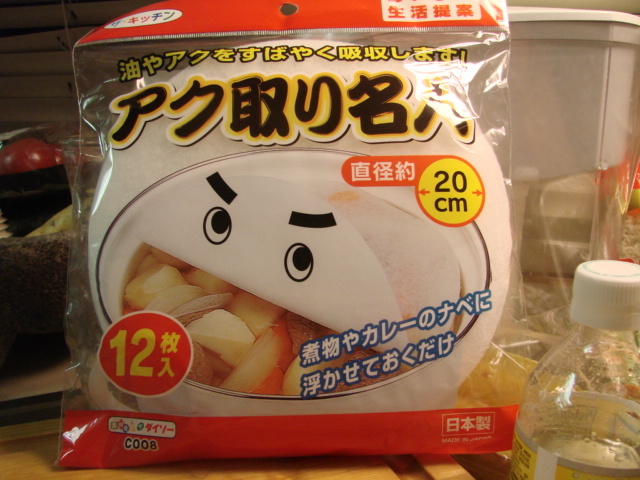 When the goin' gets tough I comfort myself with preparing food. 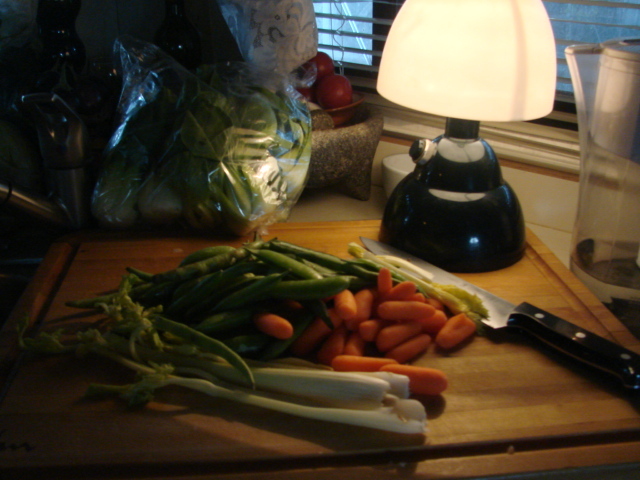 There is something about preparing food, the planning, chopping, slicing and dicing that gives me comfort. It makes me feel like I'm "doing" something when I can't really "do" anything. I'm not hungry, I just cook. I've made a few meals with flames cresting the hills too close to us with ashes falling on us. I busied myself and juiced the little calamansi. They are so small I was able to juice them two at a time. I now have 1/2 cup of lime juice. 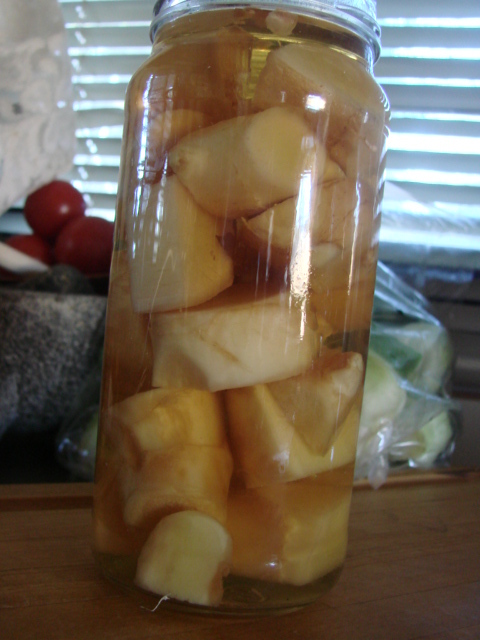 I also had some fresh baby ginger that I needed to take care of so I chunked it up and put in some sherry to preserve it. That went into the fridge. The pieces that didn't fit into the jar I grated on the ginger grater, that and it's juices went into the freezer. We were without electricity most of the day. 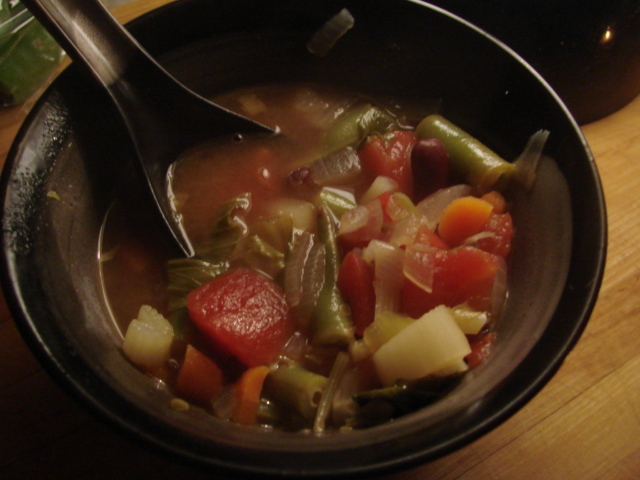 I waited a little too long to start making a pot of vegetable soup, comfort food, and most of it was made in the semi-dark. 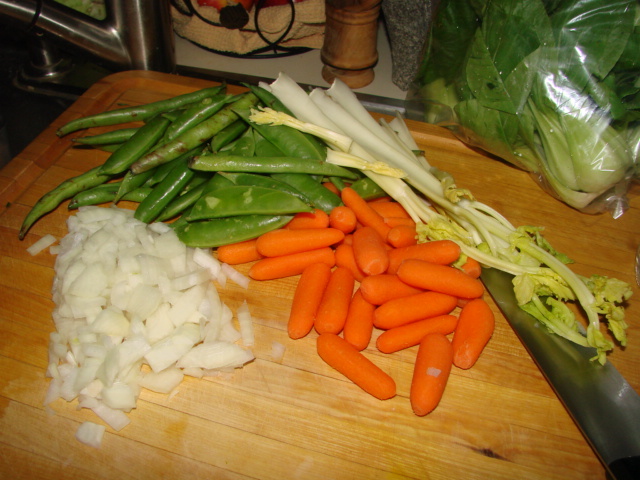 I had some bok choy, celery, onion, carrots, sugar snap peas and green beans. The greens were added the last few minutes along with some dark red kidney beans. I used the thyme mix I bought at Parsian Mkt. It is delicious. 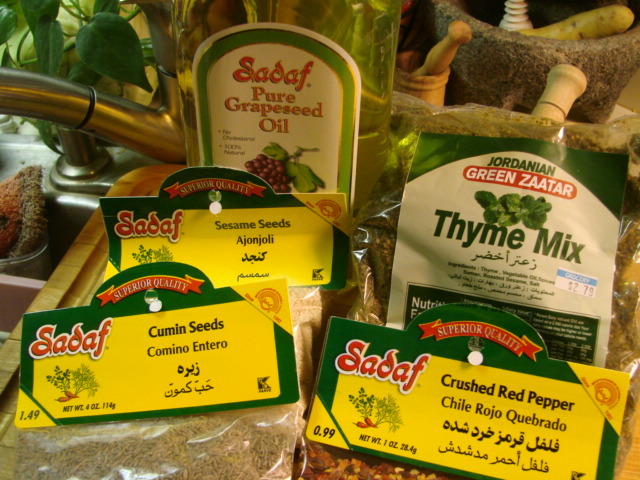 It contains: Thyme, vegetable oil, spices, sumac, roasted sesame and salt. I was tempted to eat some right out of the bag it is so good. Eating in the dark is a whole different experience. I was more aware of textures, taste and the size and shape of the food. Thank you to everyone for your concern for San Diego residents. Please keep us in your prayers and good thoughts. I'm blessed, me and my family members still have our lives and homes. 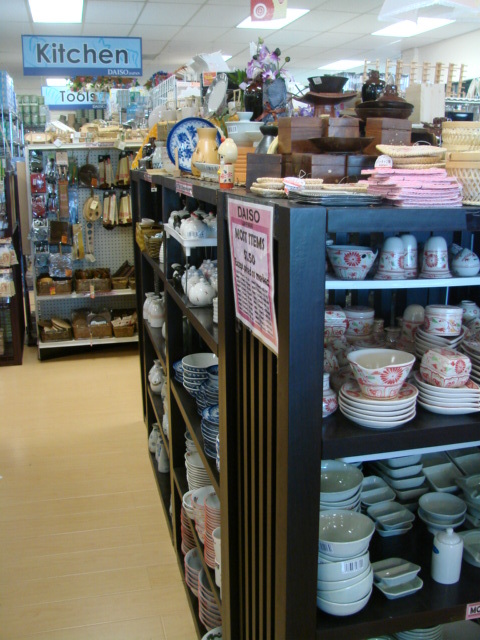 Very few items are priced differently and are clearly marked. 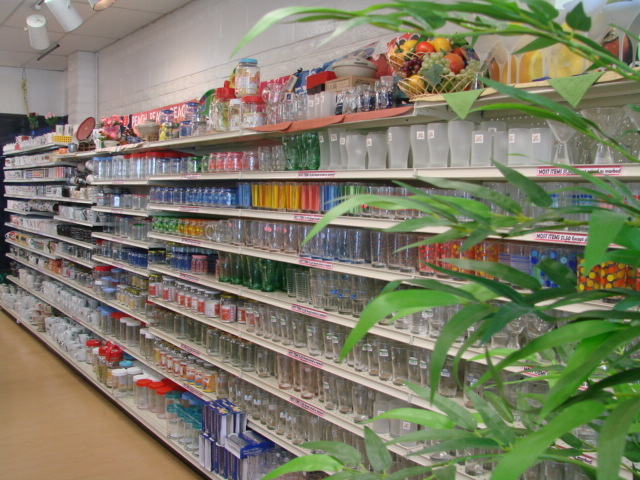 The store is immaculately clean and the staff friendly and helpful. 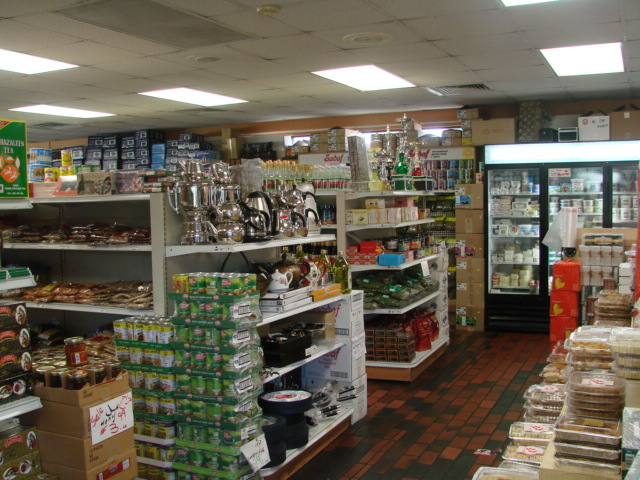 There is a grocery store in a separate building that we didn't go into, Ranch 99 Mkt was on my list also. 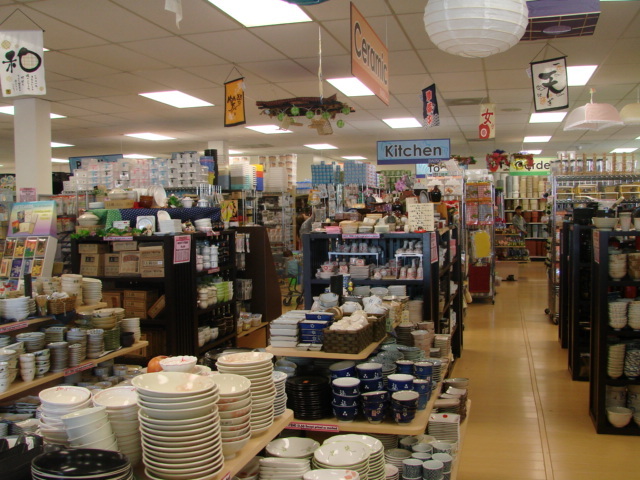 They have several departments, some being kitchen, dinnerware, stationary, bathroom, beauty, home decor, office items, containers etc... Of course I was mainly interested in the kitchen and dinnerware aisles. Here are a few of my finds. 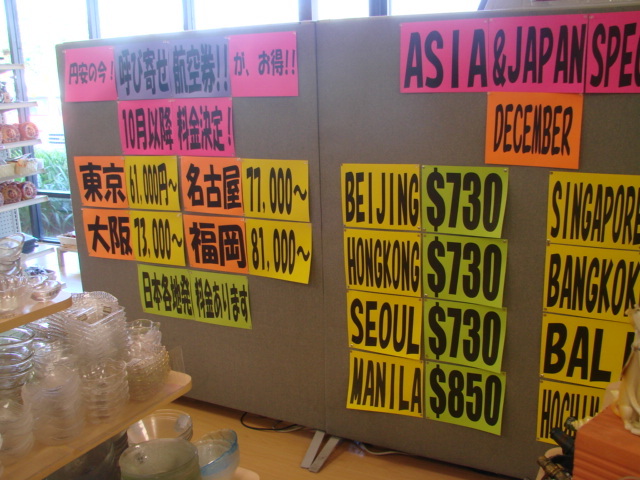 Everything I bought was 1.50 each. It is nice merchandise, not at all what you would expect for 1.50. 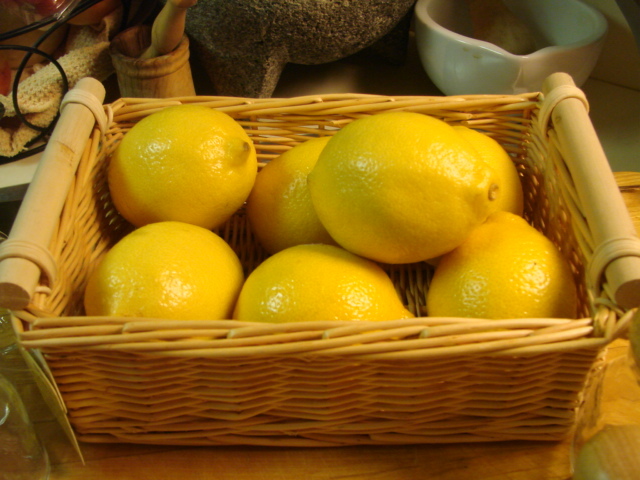 The first item that went into my shopping cart were some spice bottles and a little basket for my lemons and limes. 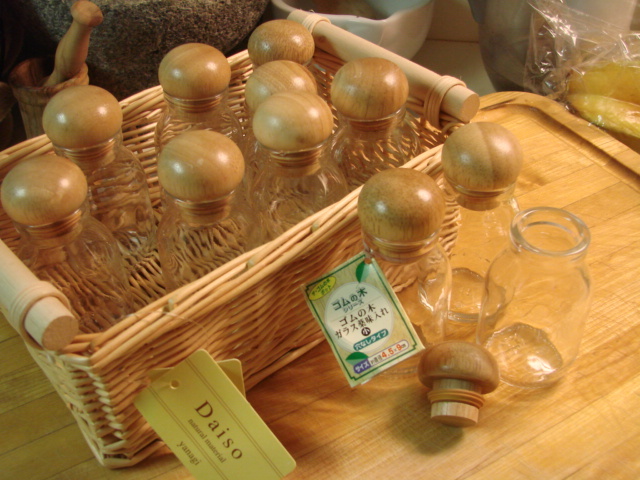 The spice bottles are 3" high and the basket is 8 1/2" by 6". 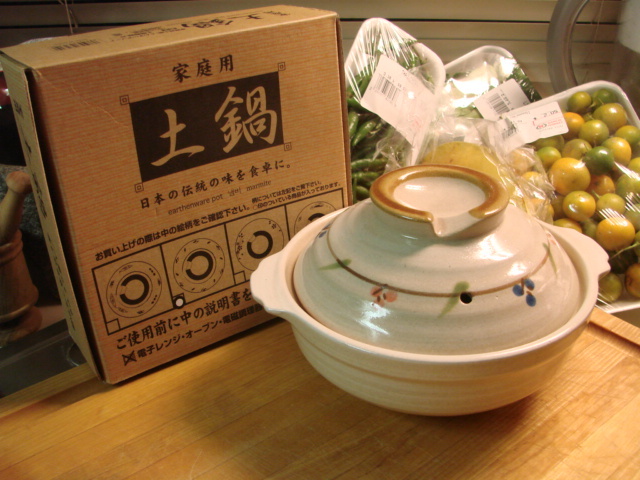 Then I found this neat little casserole soup bowl. It's 6' across inside. 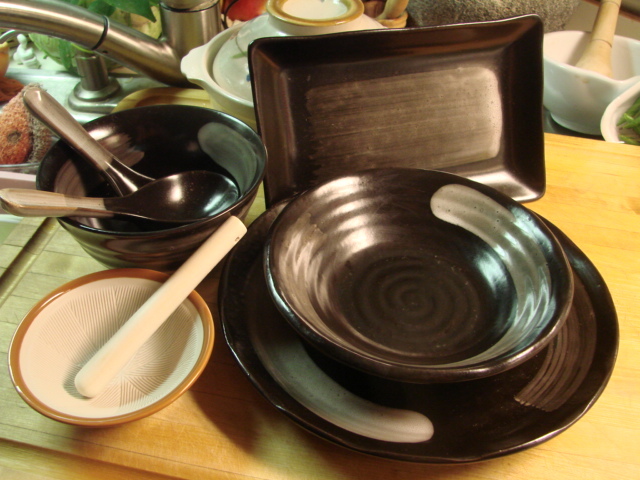 Then I scored a couple of individual pasta bowls. This is what I'm really excited about. Can't wait to see how food photographs on these. 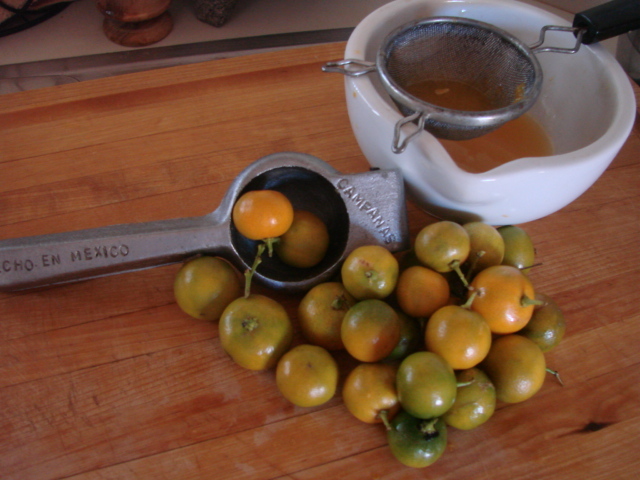 I know, I bought another mortar and pestle, hey, I didn't have one that size or style. 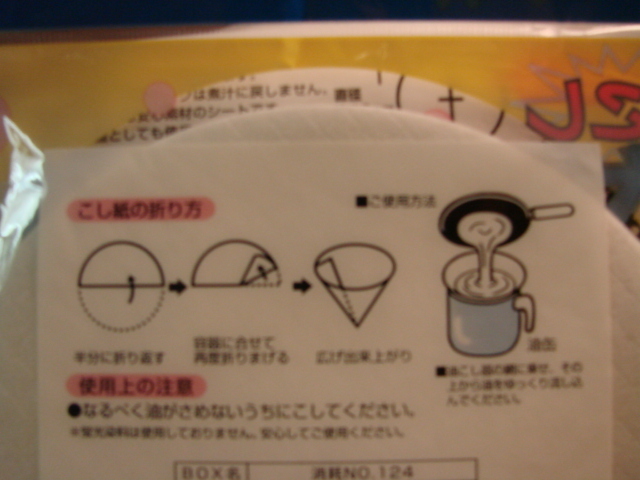 At first I thought this would be for straining stock, but the picture shows a beverage mug so now I don't know. 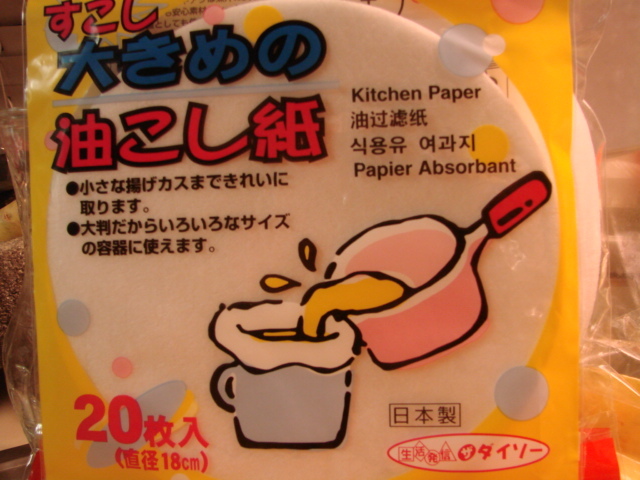 I was thinking it would work for draining yogurt. There was just too much to take in so I think I need to go back. 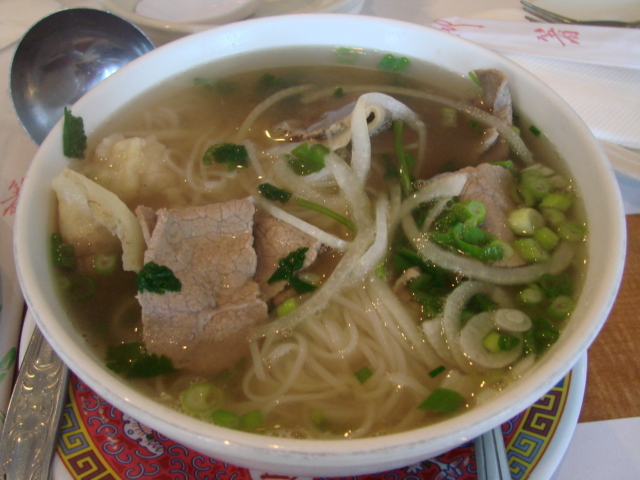 I have been hungry for Pho for the longest time and today I finally got some. Daughter Vicky and I went to Phuong Trang. It was recommended to us by a Vietnamese couple we sat next to at Sushi Time. We went back to Sushi Time again. 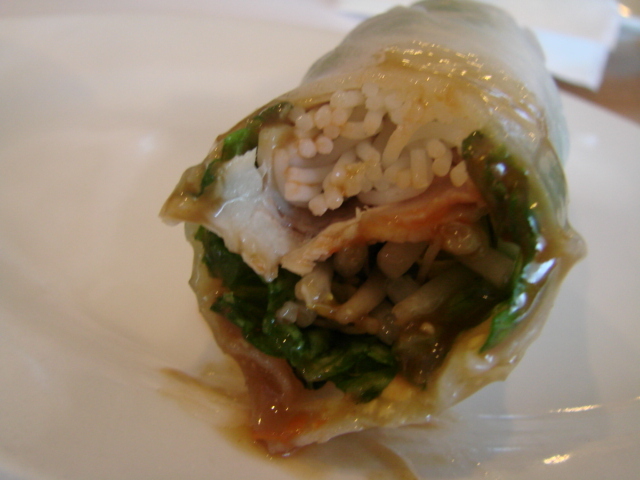 Vicky has never had Vietnamese food so I introduced her to Pho and fresh spring rolls. 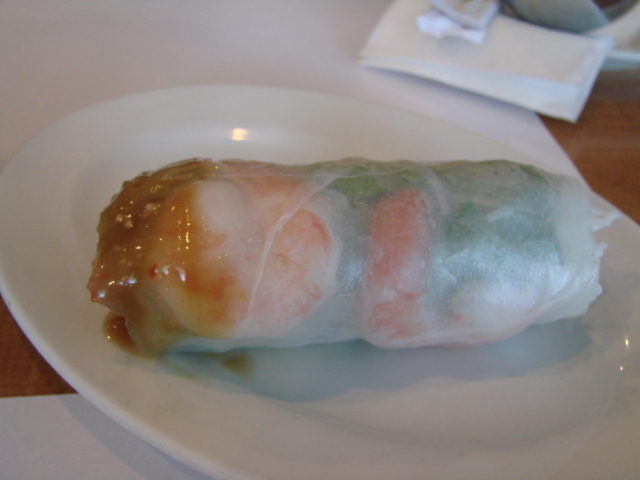 The Vietnamese woman I used to work with calls them summer rolls, whatever, they are delicious. I was so excited to be there that I forgot to take a picture of the restaurant, oh well, the food is more important. They were very fresh and of course perfectly rolled. I think mine are as tasty, just a little more "rustic"
Vicky liked the fresh spring rolls so much that when we went to Ranch 99 Market she bought the ingredients for making them. We had the Pho with rare steak and well done brisket. I didn't write down the Vietnamese name :-( We wanted to share the Pho and they were very accommodating and brought out two bowls, spoons and chopsticks and a ladle. I thought they were a little light on the herbs for the Pho. In the past at other restaurants, I've had more greens than just basil and bean sprouts. It was delicious and I slurped it right down. The spoon never left my left hand, nor my chopsticks my right. The broth was not greasy and the meats were tender. 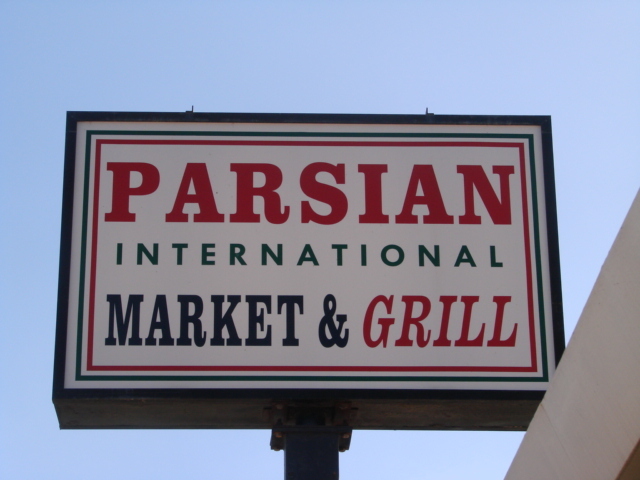 When we left the restaurant we saw down in the next block an interesting place Parsian International Market and Grill. Off to another new experience. We found another little treasure today. 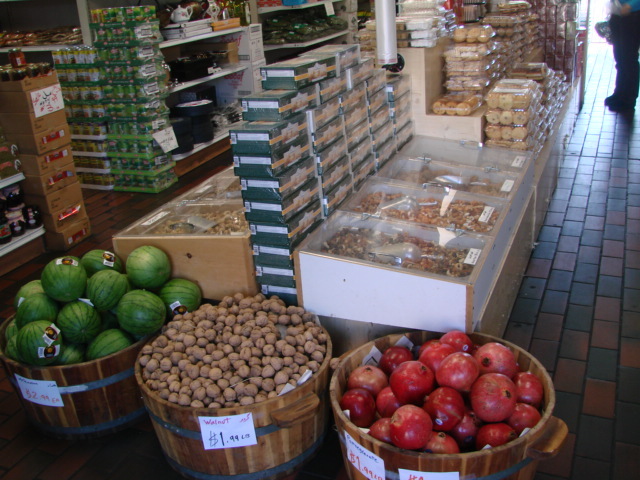 It's small but it is neatly packed with fresh produce, bread, teas, and cheeses from around the world. 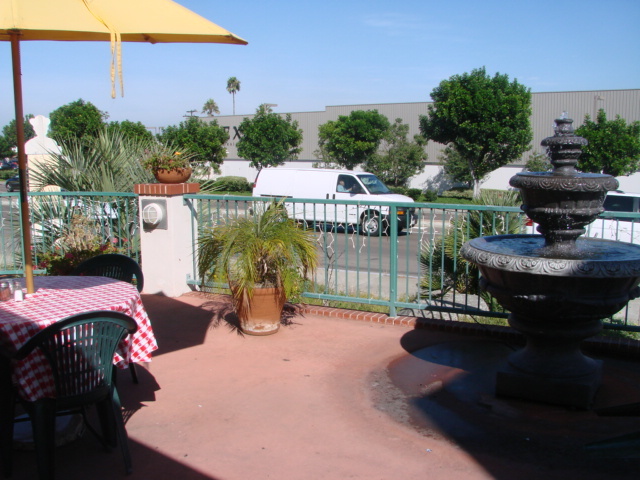 Street side is a nice patio with a water fountain and tables. Right inside the front door is more seating if you don't want to sit outside. The proprietor and his able assistant, his charming daughter, were most gracious. I needed a few things for a spice mix I want to make and found all I needed and then some. The Thyme Mix caught my eye. It contains thyme, vegetable oil, spices, sumac, roasted sesame and salt. Don't know what in the world I'm going to do with it but I'll find something. I'd like to go back and try their Grill. The menu looks good. They have appetizers that include Hummus and an eggplant dip. Soups and salads. One soup they have, a vegetarian one looks interesting, it has lentils, garbanzo beans, fresh herbs, noodles, garlic and mint. 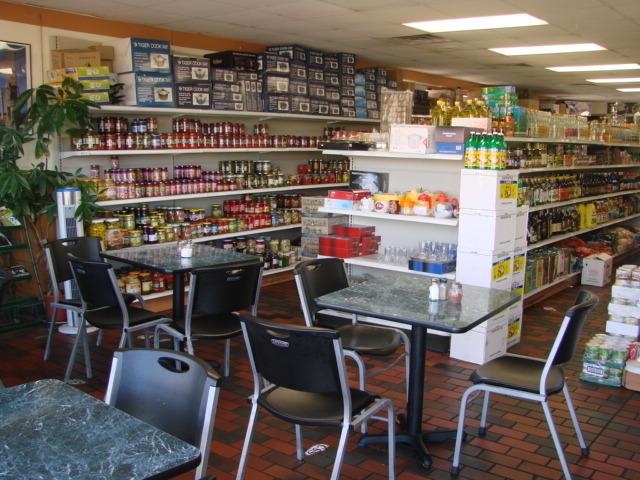 They also have kabobs, stews and sandwiches and wraps. And they cater. We made a Costco run this morning. 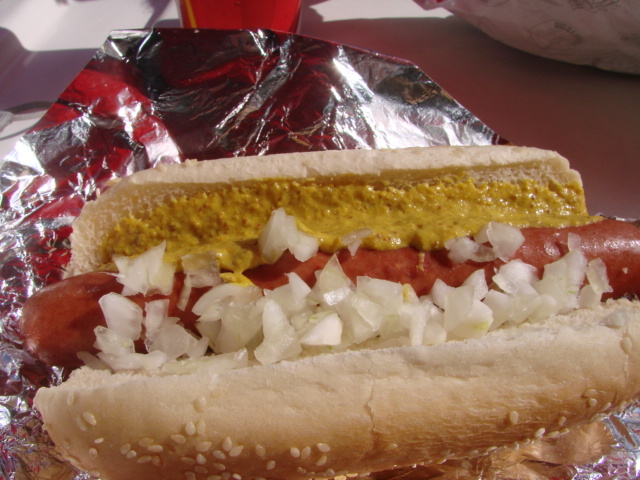 Undecided as to what to do for lunch, we just grabbed a quick Polish dog at Costco. Dang those things are good. I haven't had one in such a long time I forgot how good they can be. Some deli mustard and onion for me thanks. It was nice and juicy and the skin "popped" when you bit into it, just perfect. On our way home we saw Ray's Bitchen Kitchen along side the road. Screech!!! turned the car around to pick up something for dinner. Ray really hooked us up. 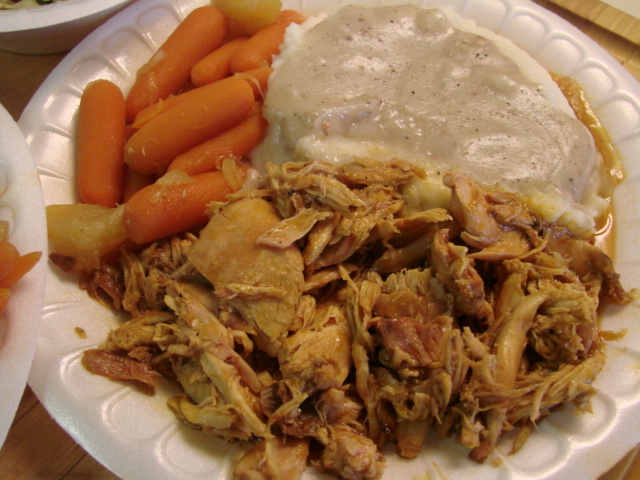 We got one plate of smoked chicken and one of smoked pork. Ray made some real mashed potatoes that he spiced with the perfect amount of garlic. This was topped off with his homemade giblet gravy. He cooks the giblets for the flavor but does not chop them into the gravy (thank you Ray for that.) 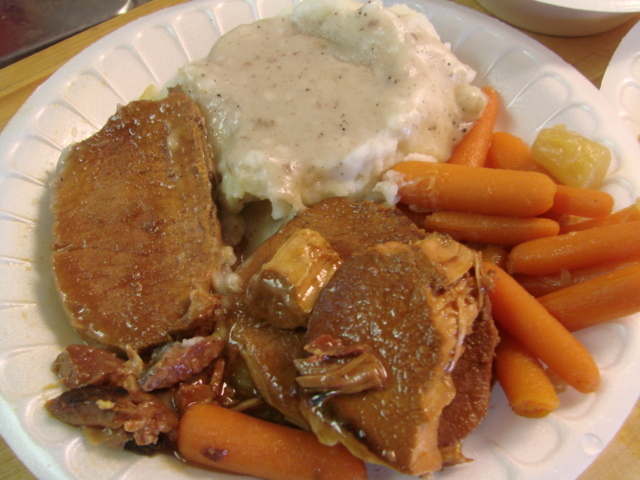 The gravy is nice and smooth with just the right amount of body, not too thick, not too thin. This was served up with some delicious carrots that were cooked up with some pineapple. We also got a nice salad of romaine lettuce that was mixed with carrots, broccoli, red cabbage and dried cranberries. I am stuffed. I'm sure everyone's meal was as good as mine was today. 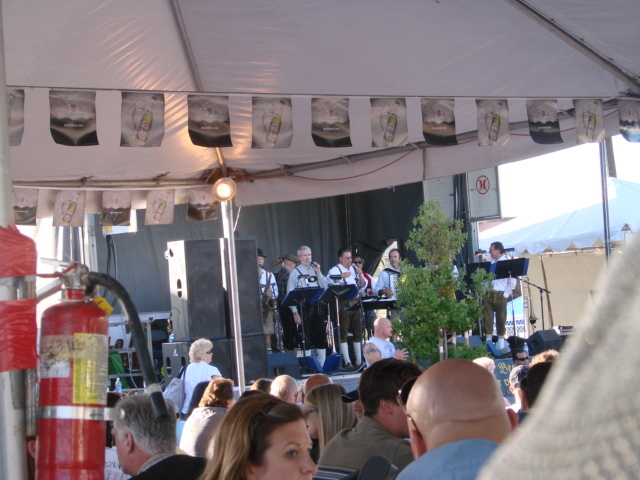 Since we played all day at Oktoberfest we had to get busy and run our errands the next day. I firmly believe ;-) that one should not grocery shop while hungry, so Stan and I stopped at an Italian Restaurant for lunch before going grocery shopping. 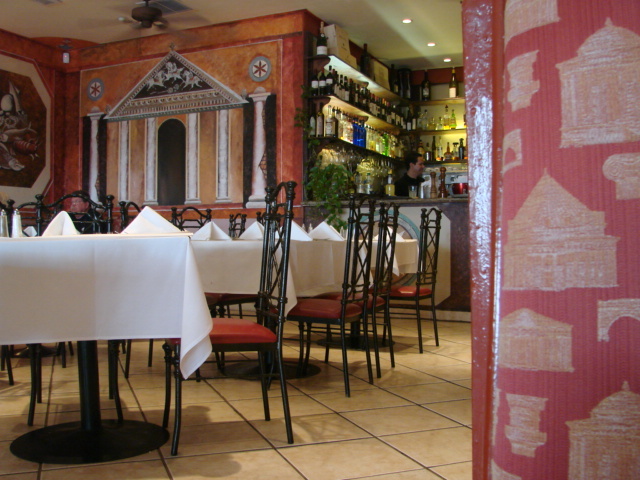 This restaurant is one we hit up once in a while. We shared an antipasta salad with an order of garlic bread. 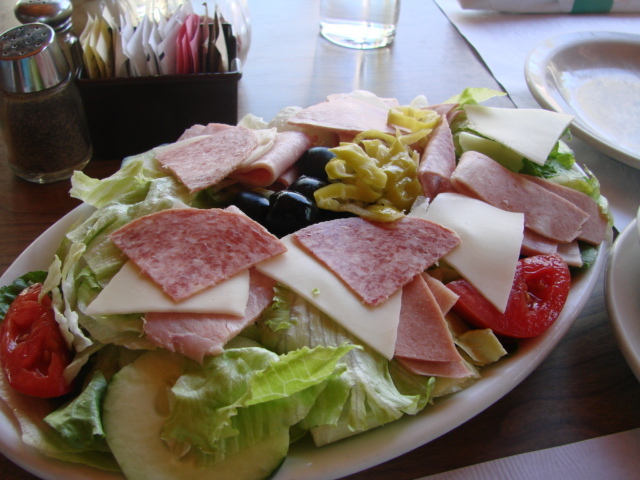 The salad had plenty of meat and cheese with regular ol' black olives and some sliced pepperoncini, with tomatoes and cucumbers on iceberg and romaine lettuce. It was o.k. the Italian salad dressing was delicious. 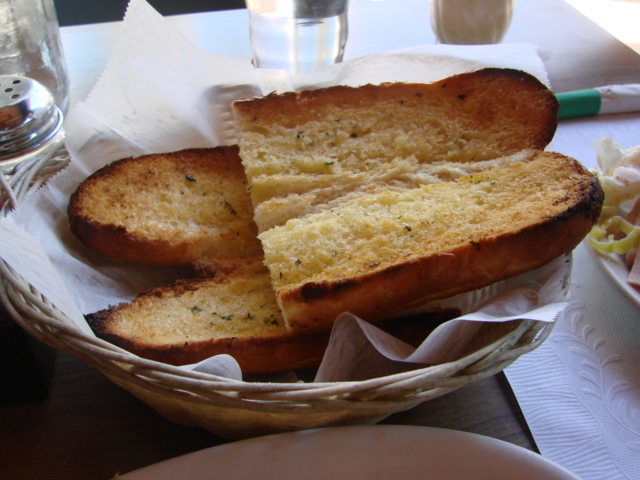 The garlic bread was nice and garlicky and crunchy. I usually order, Baked Stuffed Shells, but instead I had a 9" personal size pizzetta. 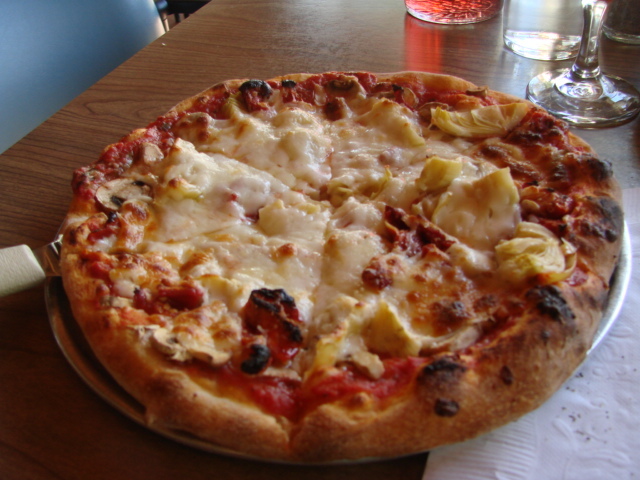 I ordered the Quattro Stagioni that has sundried tomatoes, artichokes, fresh mushrooms and mozzarella cheese. It was fantastic. 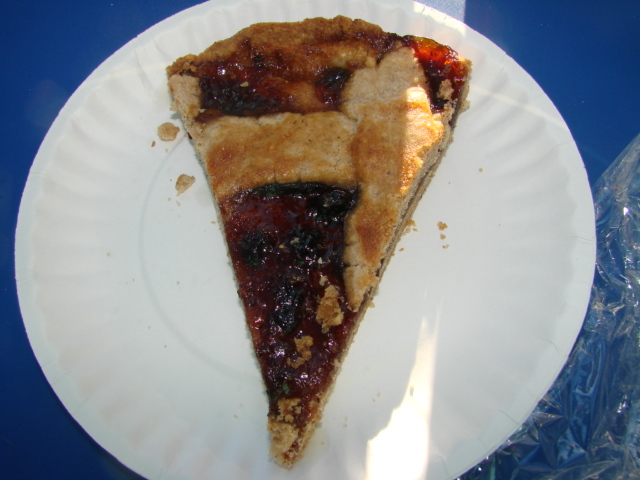 The crust had a nice chew to it, it was on the thinner side but able to hold the ingredients. 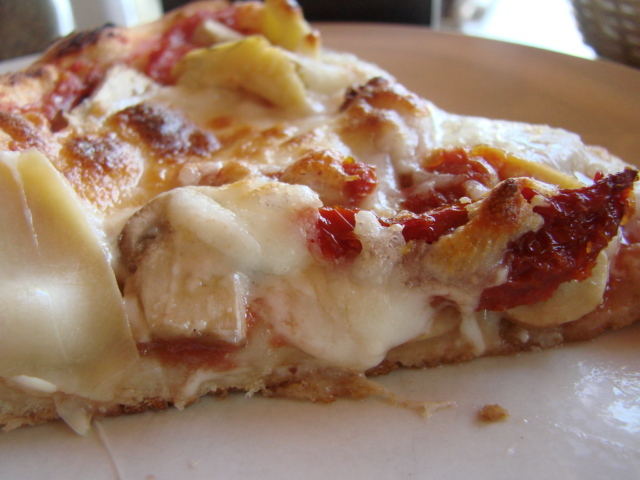 The flavors of the toppings were a good balance. Their sauce is delicious and has pieces of real, fresh basil in it, yummie. 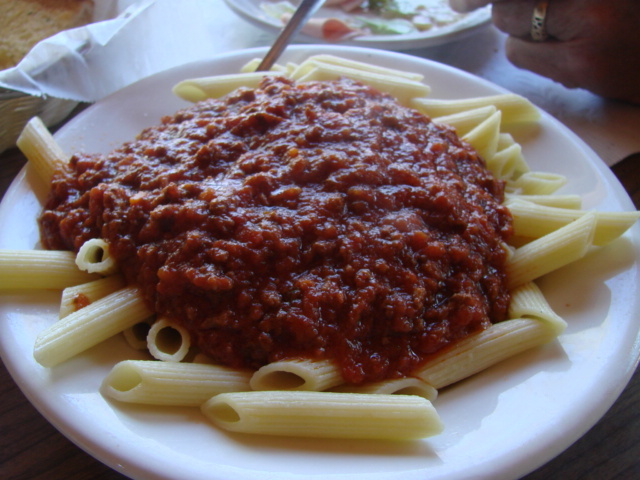 I loved it when I bit into a sundried tomato, it leant that punch of flavor that jazzed it up a bit. Went home with some nice leftovers for lunch the next day. 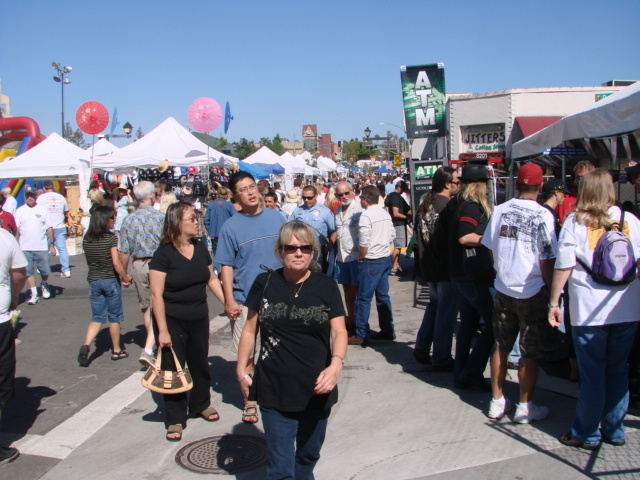 Today we went to Oktoberfest in La Mesa. We met up with daughter Vicky and son in law Bill. The first thing we did was get some bratwurst and beer. The bratwurst seemed exceptionally good this year. I don't know if it was because I was really really hungry or what, but they were really really good. 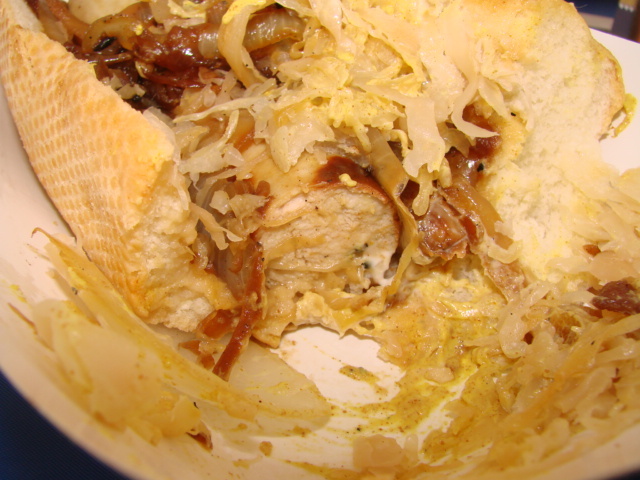 I like mine with grilled onions and sauerkraut with a little spicy brown mustard. I cut the end off to show the bratwurst under all that mess of goodness. See the spices in it mmmmm. 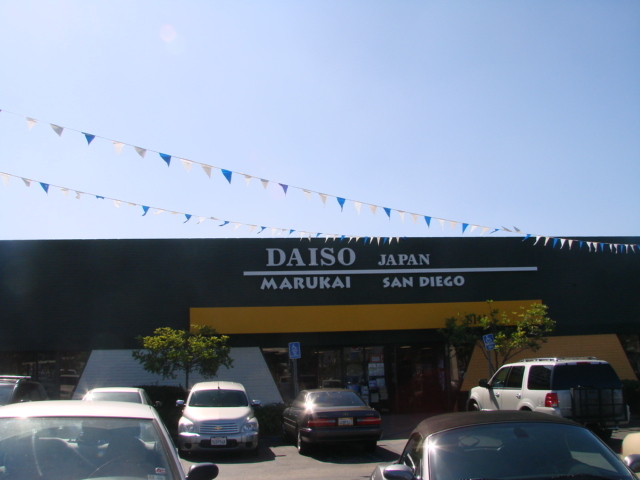 they are located in downtown La Mesa, right in the heart of Oktoberfest. 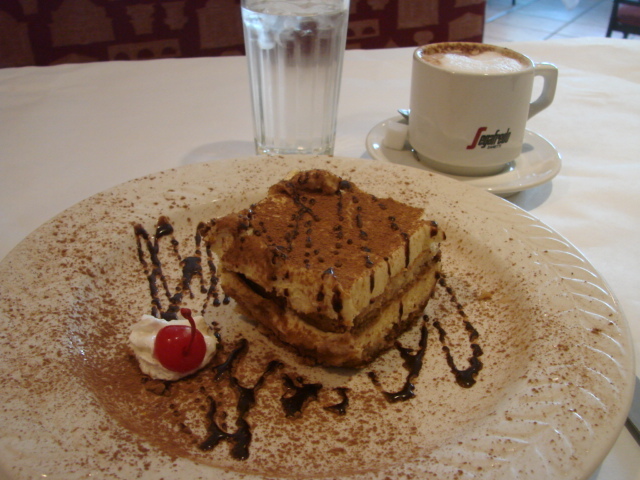 I was wanting to sit down in a restaurant and have a cup of coffee and a little dessert. 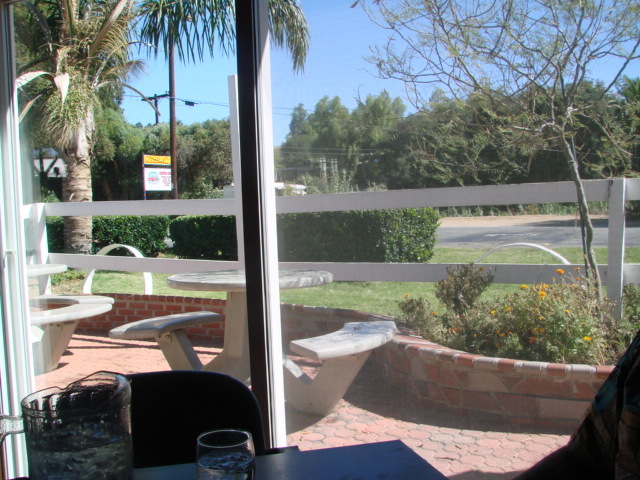 I walked into the restaurant and saw the beautiful decor and the tables covered in white tablecloths with cloth napkins. Whoa!! I wasn't expecting this, I was afraid just having dessert and coffee wouldn't be looked upon with much favor. I told the man that greeted me at the door that I only wanted dessert and coffee. 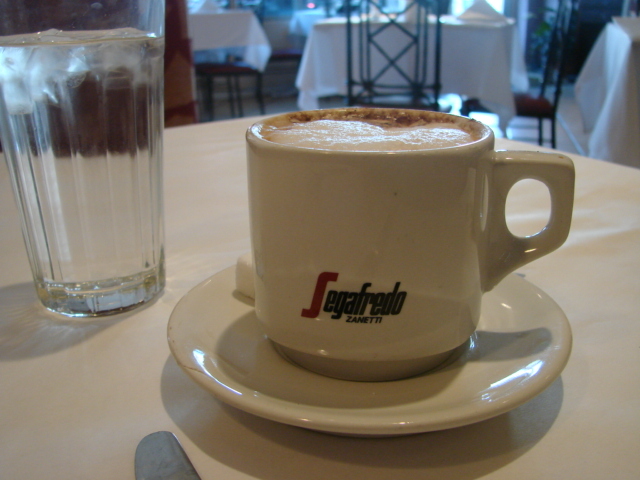 He happily seated me at a nice booth and a waiter was there quickly with a dessert and coffee menu. I discussed the desserts with him and found that most of the desserts are made right there in the restaurant. 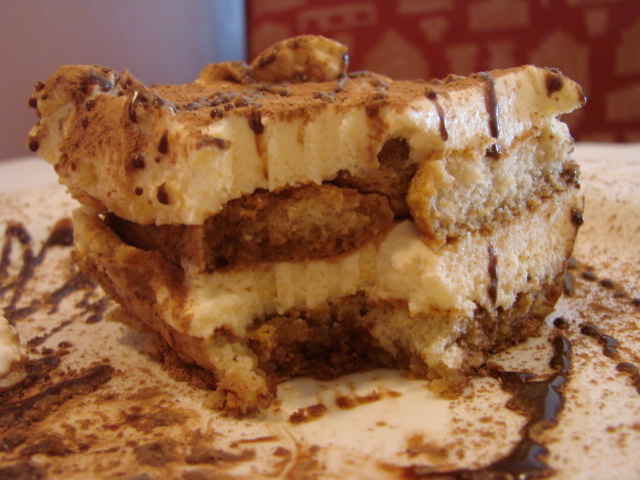 They have three different kinds of tiramisu and a baba Amaretto. You have to click on their link and read the dessert menu, it was so hard to decide. Of course I was taking pictures of my dessert and told the waiter I have a food blog, he thought I said I kept a food log and wished he was so disciplined. We both had a laugh over that after I explained what I meant. The news made it to the kitchen because before long the chef Anna Maria Baslietto came out and introduced herself to me. She was so very gracious and explained to me how she makes the tiramisu. 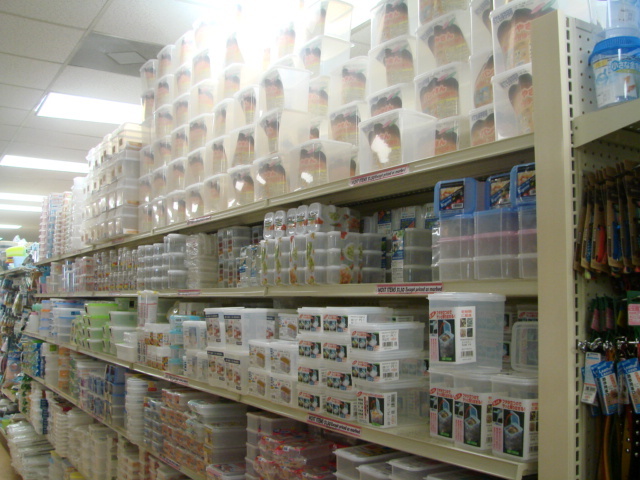 She uses pasteurized eggs and imported Marscapone as well as imported biscotti. The strawberry tiramisu is her latest creation, I need to get back there for that one. 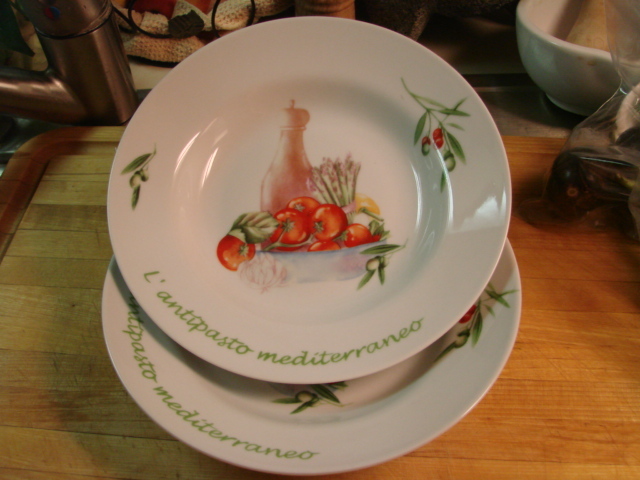 She is from Genoa and one of the owners is from Calabria and the other owner is from Mexico City. Daughter Vicky, and her friend that joined us later, caught up with me in the restaurant. They weren't hungry and didn't order anything, yet they were brought glasses of water and were treated as though they had placed an order. I was very impressed with the exceptional dessert and service. 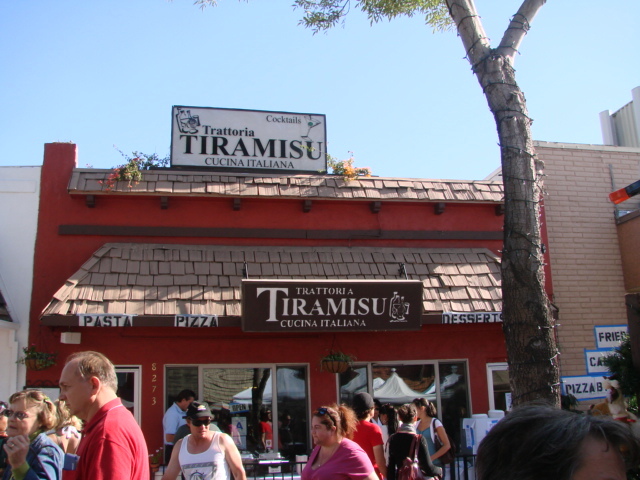 I am anxious to go back and try some of their pasta dishes. 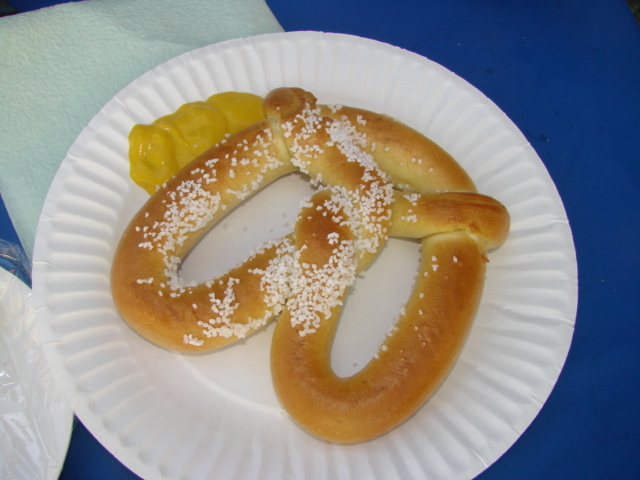 After this brief respite, off we were to enjoy more of Oktoberfest, which of course included more food. 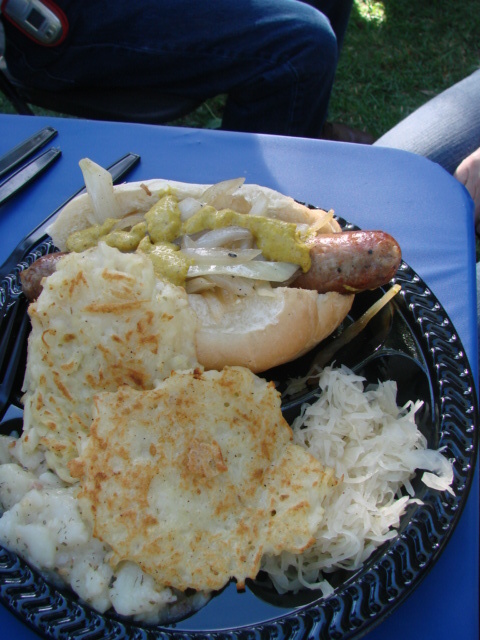 Now the girls that were not hungry for dessert got their appetites back at the beer garden and ate another bratwurst with potato pancakes, hot German potato salad and cabbage. I tasted the potato pancakes and the potato salad. The potato pancakes were delicious and the potato salad was a little flat. 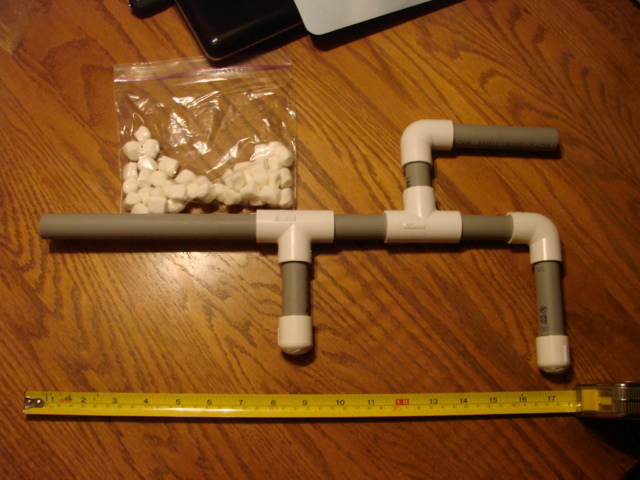 or buying the grandsons marshmallow shooters that came complete with ammunition. I did buy two, one for each boy, but I had so much fun shooting marshmallows off in the beer garden that I just might have a hard time giving one up. My long time friend Ree came for a visit last weekend. I was thrilled to see her as it's been a long 5 years since we've seen each other. We had the best visit. First, I would like to give a tribute to Ree (real name Nancy) I met Ree 37 years ago while I was living in Coronado Ca. 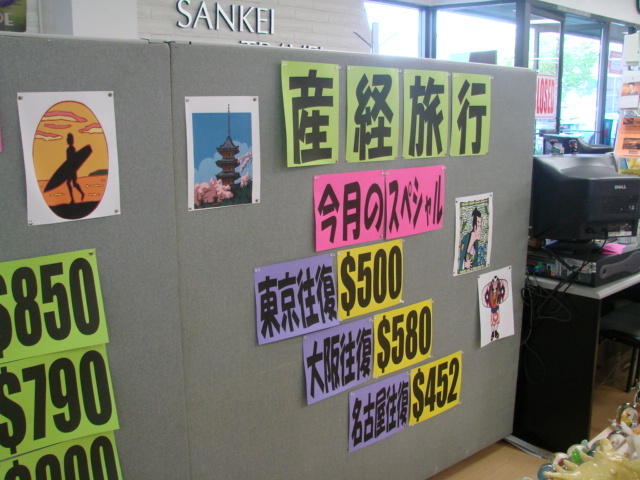 I had just come home from the hospital on the condition that I would stay on total bed rest for a while. I was allowed only to get up to go to the bathroom. While I was in the hospital Ree arrived from Chicago to visit my next door neighbor a friend of hers from Chicago. Ree spent the rest of her vacation caring for me during my bed rest. She fixed all my meals, kept me and my house clean and kept me entertained. I know we OD'd on game shows and soap operas. For the next 37 years she's been there for me through thick and thin, more thick than thin and for that I am eternally grateful. My wish is that everyone would be blessed with a friend like Ree. 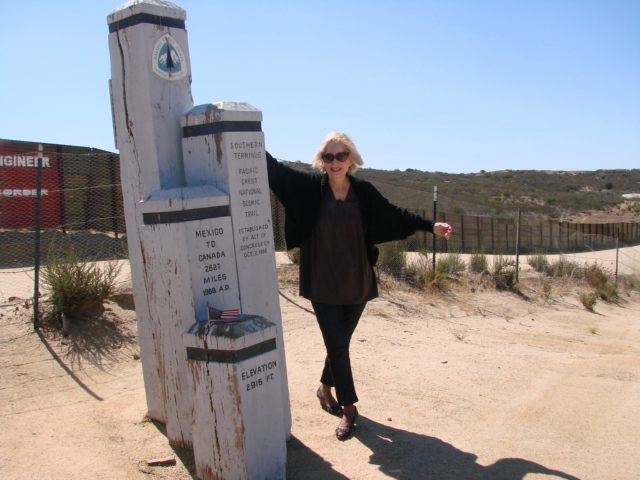 She got the grand tour of the area and that included a trip to the Mexican border to see the marker for the start of the Pacific Crest Trail O.K. it's a small town what can I say, that's one of our highlights. 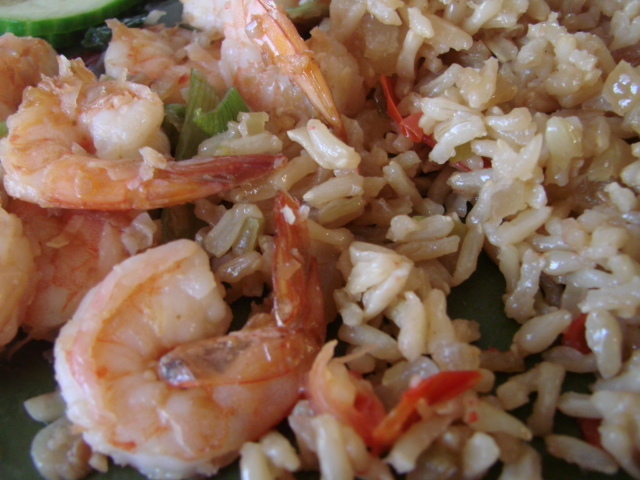 Earlier in the day I made the rice to go with the shrimp. I used an organic brown basmati rice. 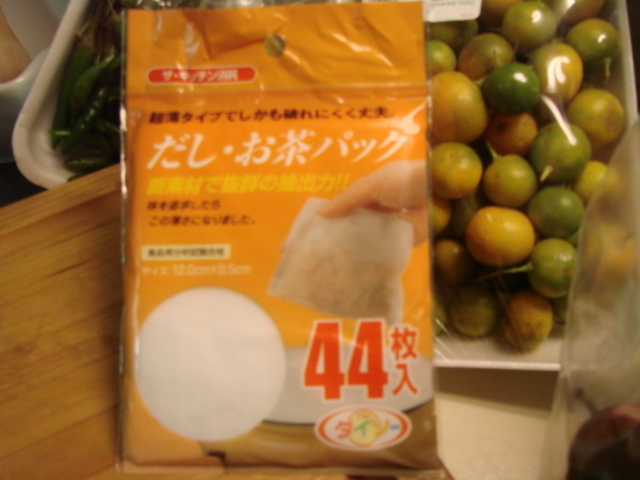 I used part of the recipe on the back of the rice bag and a suggestion from a fellow rec.food.cooking participant and came up with the following. 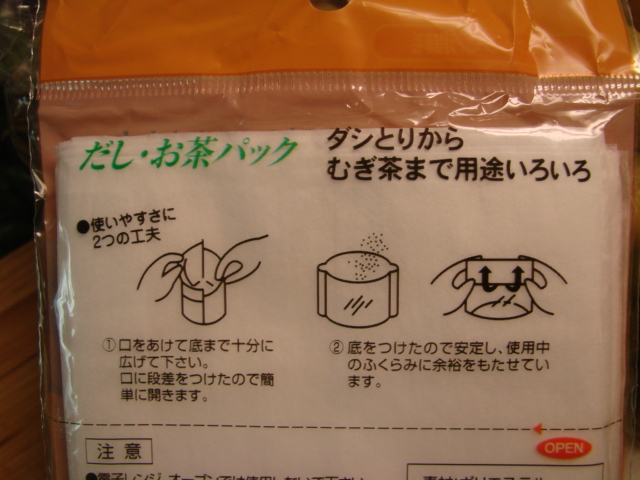 Cook the rice according to package directions including the bay leaf and butter. 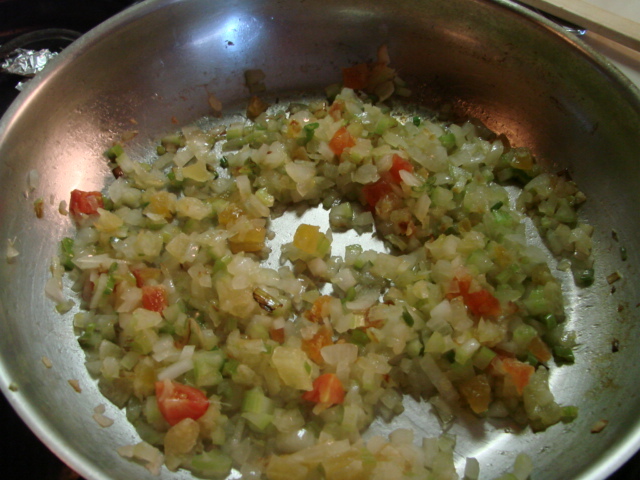 While the rice is cooking, in a medium skillet cook the onion and celery in the vegetable oil for about 3 minutes. 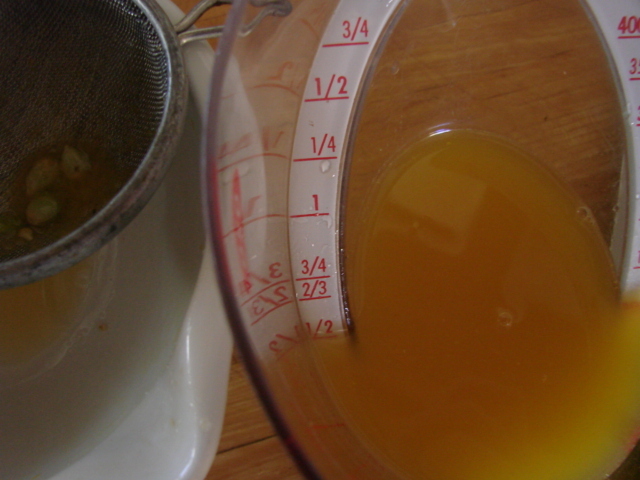 Turn off the heat and add the tropical fruit mix and the ginger. 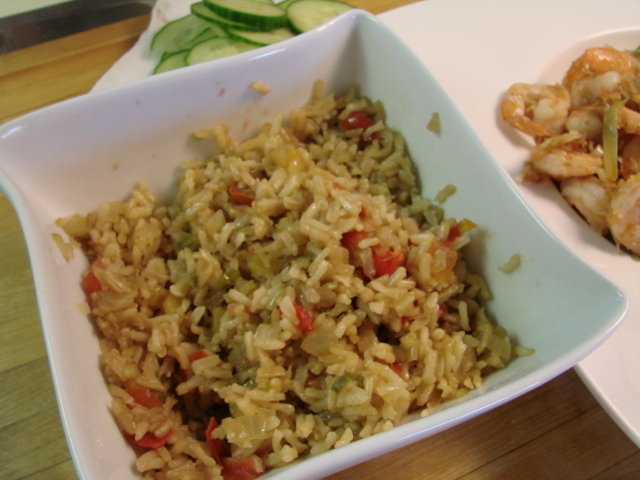 While the rice is steamy hot gently stir in the onion, fruit mix and the tomatoes. After our afternoon excursion I made the shrimp. 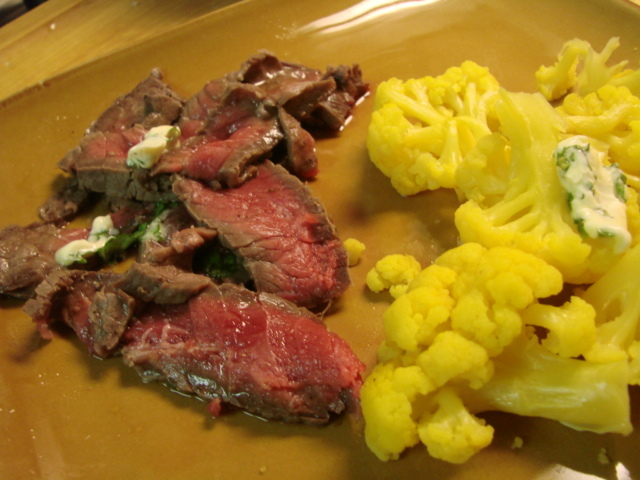 It is a quick and easy, yet "showy" dish. 1. Toast the coconut: In a dry, nonstick skillet, toast the coconut until golden brown. 2. 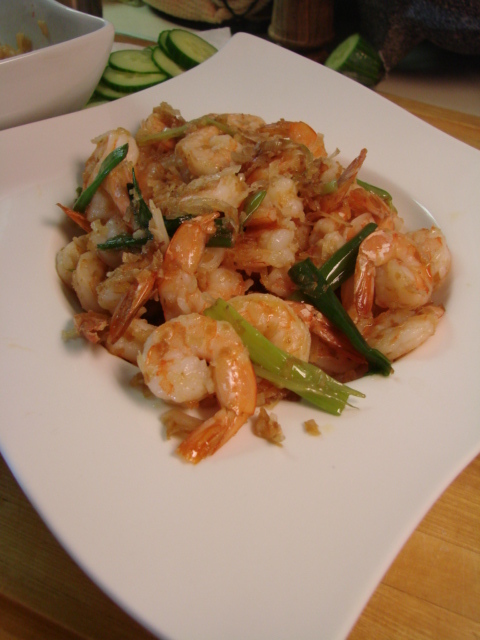 Fry the prawns: In a large saute pan or wok, heat 2T cooking oil on high heat. When smoking, add the prawns. Cook only half way. Timing depends on size of your prawns. When they just start to change color, remove and set aside. 3. 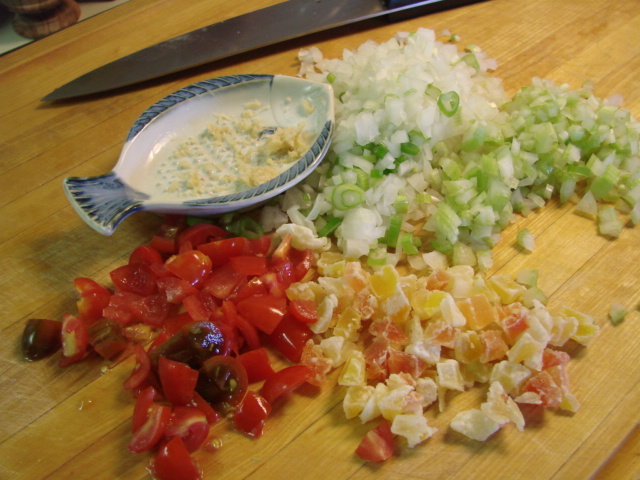 Stir-fry: In same pan or wok, you should have some cooking oil left over. If not, add 1T. 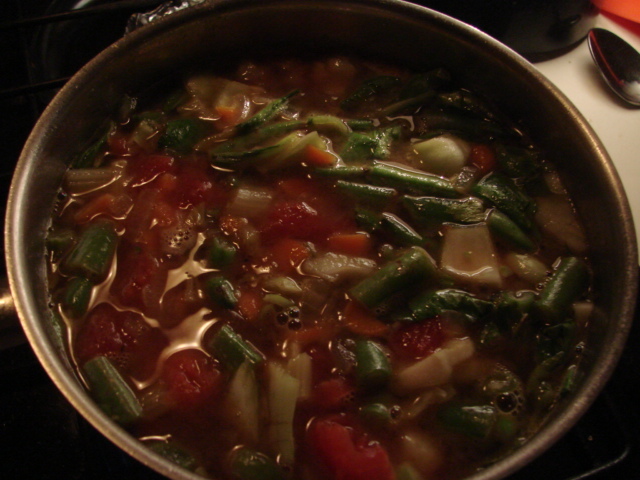 When hot, add the scallions and garlic. Fry for 10 seconds until fragrant. 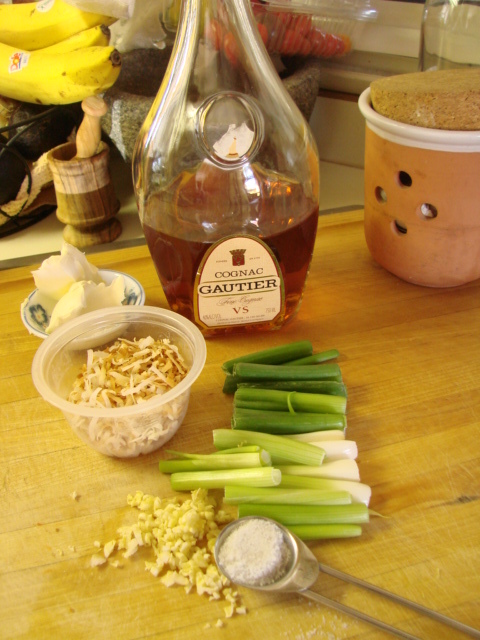 Add Cognac, butter, salt, sugar. Reduce just a bit - you should have a nice sauce that will coat the prawns. Add the prawns back in the pan. Fry until prawns are cooked through. Again, timing depends on size of prawns. 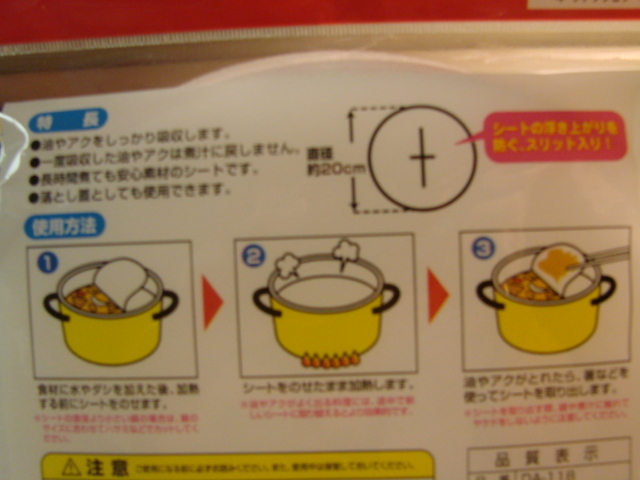 For small = 1 minute; medium = 1.5 minutes; large = 2 minutes; colossal= you prob have a personal chef. Turn off heat, add the toasted coconut and immediately serve. I assembled the ingredients. 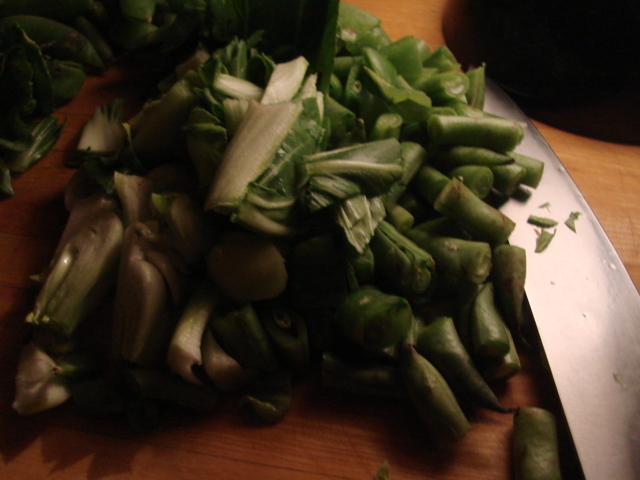 Next time I'll cut the scallions lengthwise into slivers. As it was I only cut them in half. I got to talking so much that I didn't get photos of the shrimp cooking process. I was informed to stop talking so much and take pictures. That came from a true foodie. ;-) on alt.binaries.food newsgroup. It definitely will not be 5 years before we get together again. We do talk on the phone and e-mail but it's just not the same as getting together. We'll be meeting around half way between San Francisco and San Diego for "girls" weekends. Thanks Ree for making the trip. I'm looking forward to getting together again soon.